Stevenson Que: They Say: "What I Miss About DLSU-D"
They Say: "What I Miss About DLSU-D"
"Hail! Hail Alma Mater! Hail to De La Salle!". Remembering the time while I was singing these lines on my Graduation Day last March of 2010, with so much heart and might just gives me chills. Nothing like it gives me a strong feeling of pride that for once in my life, and forever will, I shall bleed green. Truly, one of the biggest things in my life that I am certainly proud and thankful of, is the fact that I am a La Sallian. For four years as a La Sallian student and another five years as a La Sallian educator, the culture and the heart of this Green institution has brought me to places I have never thought I'd be in. But there are a lot of things that we really miss and remember after all those years. Specific memories like lunches at Jefcee's involving friends, Burger Steaks, and Shakes, early morning prayers during examination week at the University Chapel, lively conversations at the JFH kubo with your barkada as you show them your best impressions of your worst professors, and just the walking and walking and running and walking towards your next class at the other side of the campus. 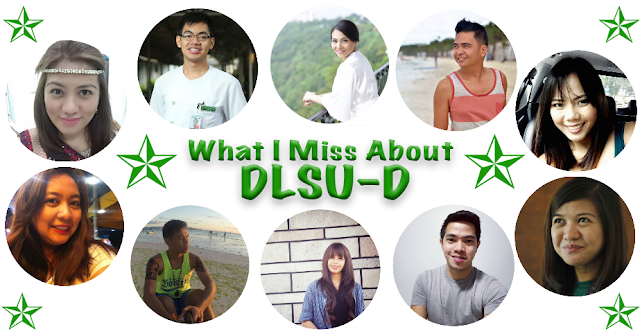 Let's here what my dearest brothers and sisters from DLSU-D say as they answer "What do I miss about DLSU-D?" "3 things I miss in DLSUD:  Food at the Square Canteen. There's a lot of food choices like the pasta in Oven Maid and Ate Siony's Pork sisig. Walking along the University Avenue - Gives me time to think of what to do and also meet friends. And last but definitely not least,  the very loving and nurturing professors and staff. I'll surely go back to Dasma whenever I have the time." "I miss the feeling of being home while at DLSU-D. It has a breathtaking environment welcoming me each day which made my student-life delightful. I miss the La Sallian community, my professors and classmates. I love hearing messages in the Chapel too!" "When I was studying at DLSU-D, my classroom is at the CBA Building which is located at the middle of the campus. Being a huge campus, I used to walk from the gate to the CBA Building. That's what I miss most. The long walk going to my class." "What I miss about DLSUD is the "homey" feeling when you are inside the campus. The chill vibe and the feeling like you are one with nature (not to mention we are the greenest campus). You know the feeling when you just can't wait to leave, but when the time comes, you'll feel a little bit of sadness. Unexpected #sepanx it is!" "Definitely the long walks from Gate 3 to our classroom buildings, passing through the university oval, that's one thing I will never forget. Aside from that, being in the library on my vacant periods, sitting on the floor, reading every pocket book and novel I can get my hands on." "DLSU -D has been my home for 4 years. This is where my personality was harnessed, where I was able to appreciate life even more, as I realized that not everyone or every student are privileged to study in this university. There are a lot of things or people that I miss here. First is my TWI family, Lani, Shinna, Chow, Dessa, Zan, Maroe, and Tina. The years of studies and exams every semester have been tough and I couldn't have made it without them with our every day pikunan, kulitan, and tawanan at the end of the day. I miss walking at the EDSA pathway or the main road from Gate 1 going to Square Canteen just like fall season because as you walk with other students, leaves from the trees are falling as well. (MTV emote emote). I miss the buko juice from SBS canteen, the sisig of aling minervas, the stromboli from square canteen, and of course Jataynas! And of course, I miss my favorite professors Sir Geslani and Miss Sigari. Being in the university is not just about studying or learning, it is about touching lives, respecting people, and faith in God which De La Salle has instilled in me. The feeling of being in La Salle, the atmosphere, it really is different." "What i miss about DLSUD, my alma mater, eventhough I work here, is the serene, tranquil atmosphere when I walk from what we then call "coastal", the straight route now from Rotonda to the University Food Square. Perhaps because between the school population then and now, you can even reflect while walking because of the defeaning silence going to that route. Also, the food in the canteen. Back in the days, Ate Aning, the owner of A's canteen, the biggest canteen then, used to serve us their staple dish like Giniling(ground pork) with egg, which was super tasty, promise!! And their Hamonado(meatloaf) and Lechon Kawali(fried pork). This canteen was memorable to us because it serves food good for two, so were able to share so we can save! Lastly, our beloved professors, who had different and great impact in our lives, who taught us everything they knew about life and academics, who has set the path that we have taken that lead us to where we are right now. To them, we will forever be grateful." "What I really miss about DLSU-D is the serenity of the place. Students and professors can find a perfect spot where they can study, chit-chat, or even have picnics under the shades of big trees while listening to the chirping birds. Besides from being conducive for the above-mentioned activities, we consider it as a second home because we feel safe, loved, and nurtured inside the University. DLSU-D is truly an Alma Mater - a "nourishing mother"." "There are a lot of times, even right after graduation, that I was asked this question and I just smiled every time. There are lots of things to include in the list but the people of De La Salle University - Dasmariñas definitely topped. You can never see people like them anywhere else as their differences are bound by one love, love for their Alma Mater." "An environment friendly school, near my favorite computer shop, with a lot of beautiful ladies taking AB Psychology? Unforgettable haha! But most of all, those who have imprinted something on your mind helping you grow and be a better person." We all have reasons why we miss our beloved Alma Mater, but as a true blooded Patriot, these things will live on every single day for the rest of our lives. We may have spent just four, five, or even seven years in DLSU-D, but these experiences and memories will always be as colorful as a beautiful movie in our minds and in our hearts. As I always tell my students before, "I am proud to be from La Salle, but it is forever an honor to be from La Salle Dasma." 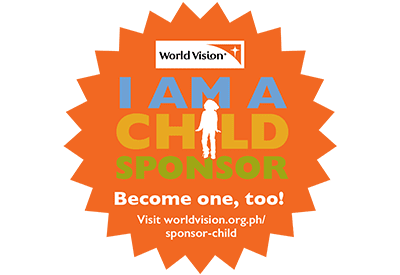 THEY SAY is a segment on my blog which features a little survey where I asked a few of my friends and readers about a certain subject. A Topic is started and they would respond in the way it applies to their lives and experiences.